Rock for Public Services 10th Anniversary at TD Place - Spotlight Ottawa	:: Spotlight Ottawa - Your local music scene. Get out and experience it! TD Place is proud to announce Colin James will headline a free concert Saturday, November 4. The 10th annual ‘Rock for Public Services’ event, presented by CUPE Local 503 and CUPE Ontario, celebrates the efforts of municipal workers and health care workers in the Ottawa/Gatineau region. Opening the show is one of Canada’s most critically acclaimed singer-songwriters, Kathleen Edwards, and celebrated local classic rockers The Cooper Brothers. “This event has also been a very successful forum to raise much needed funds for some great Ottawa charities. At the end of this 10th Annual Concert, we hope to have raised over $200,000 for local charities” says Brian Madden. This year’s charity recipient is the Ottawa Humane Society. From the prairies of Saskatchewan to the stages of the world, sharing his talent with some of the greatest and most influential musicians of all time, Colin James has quietly and steadily established himself as one of Canada’s greatest musicians. For his 18th album, Blue Highways, Colin pays tribute to some of his long time blues idols including Howlin’ Wolf, Jimmy Reed, Freddie King, Jr. Wells & Buddy Guy, Peter Green, Robert Johnson and William Bell to name a few. In the spring of 2015 after wrapping up his Hearts on Fire Tour, Colin was loving playing with his band and really happy with the sound they had created on stage. What better time to make a record! Especially the record Colin had been itching to make for years – a collection of some of his favourite blues tracks. In less than a week Colin was recording in The Warehouse Studios in Vancouver and in just two days, Blue Highways was born. Kathleen Edwards is well known for penning songs that act as perfect travel companions to their own haunted landscapes. In the years following her 2003 debut album Failer, the Ottawa native’s songs have topped the Billboard charts, been featured in the pages of Rolling Stone, graced the cameras on The Late Show with David Letterman, Late Night with Jimmy Fallon, and The Tonight Show with Jay Leno, as well as earning her several Juno nominations. In 2012, Kathleen released her fourth studio album, Voyageur, co-produced with Justin Vernon of Bon Iver, which garnered international critical acclaim. Kathleen performed on the Rock for Public Services stage at TD Place in 2014 to an eager crowd prior to a headline set by the Jim Cuddy Band. An overwhelmingly positive response from the CUPE audience paved the way for a return performance for this 10th anniversary show. The Cooper Brothers are perennial favourites on the Rock for Public Services stage. As Canada’s premiere country rock band from the 1970’s through the mid-1980s the group had multiple Billboard Hot 100 hits including ‘The Dream Never Dies,’ ‘Rock and Roll Cowboys,’ and ‘I’ll Know Her When I see Her.’ New record ‘Radio Silence,’ produced by Blue Rodeo’s Colin Cripps, was released earlier this year. 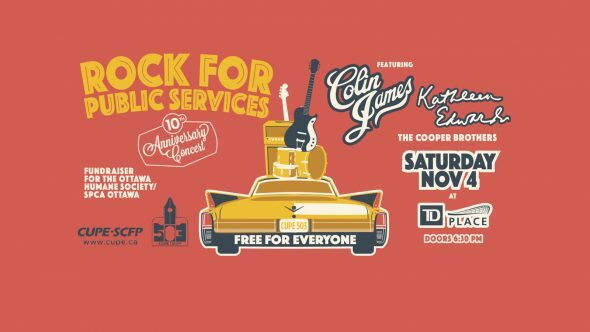 Rock For Public Services at The Arena at TD Place is free for everyone of all ages. No tickets are required for the event, seats are available for free on a first come, first served basis. Limited paid parking is available on-site.